Panasonic ES8103S Review 2107 - Affordable Price! When you buy the Panasonic ES8103S, you will be getting one of the most advanced and consistent electric shavers available today at a fraction of the price of expensive electric shavers. It also one with a unique pop-up trimmer that will also allow you to take care of the details. One reason why many men still do not use electric razors is because their only experience with one did not go as well as that had hoped. 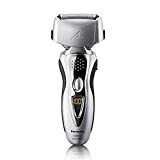 In many cases, men will go out of their way to purchase the most affordable electric razor possible, and they never realize what a difference they could have experienced had they spent just a little bit more. What Is the Panasonic ES8103S? The Panasonic ES8103S is one of the most popular wet and dry washable electric shaver that comes with a number of features that you may have never experienced with a cheap electric shaver. This has a three blade shaving system that will give you the maximum coverage and closeness, and that means that you can actually shave in a shorter period of time. The hypoallergenic, stainless steel blades are set to 30° to cut the hair at the greatest level of precision, and with a pivoting head, it is able to flow along the contours of your face with ease. With a 13,000 cycle per minute linear motor drive, you will be getting one of the fastest shaves available, and that means that the Panasonic ES8103S will be able to cut your hair as quickly and efficiently without pulling or tugging. For guys who tend to experience skin irritation with dry shaving, this extra speed combined with the angle of the blades, means that irritation should be a thing of the past. What Other Features Does This Have? Among the other features of the Panasonic ES8103S include multi-fit arc blades that independently float so that they can easily follow the contours of your face and give you the smoothest shave possible. The head also pivots 25° back and forth and 20° left and right so this is easy to use on all parts of your face and neck – and your body, too! If you happen to let your beard grow a little longer over the weekend, then the slit foil technology will make it easier to catch those longer pieces of hair, which other electric shavers often have a problem with. The LCD display will show you the battery charge, and with the built-in turbo cleaning mode, you can quickly accelerate the shaver up to 17,000 RPMs, which will get rid of all the extra hair and debris, keeping your shaver clean and ready for the next shave. You can find the best price on amazon here for the ES8103S. There are 1000’s of happy customers using this bad boy. I’m sure you will love this as well and the price is one of the best ones I have seen with the features it offers. The shaving head contains stainless steel 30 degree angled blades that will cut at the base of your beard hair. The motor is like a nascar engine running at 13,000 cycles per minute which is really important when it comes to cutting fast and not irritating the skin. The blades also float so when you are following the contour of your face like your chin, the blades actually stay close and make a perfect cut. The head essentially moves left and right. It also moves side to side up to 3o degrees. With all that said, if you compare this to one of the other expensive models and their prices, you seriously just can’t beat the quality and price of this shaver for what it does. What Do the Reviews Say About the Panasonic ES8103S? Many of the Panasonic ES8103S reviews mention how smooth and quiet this is, and that it makes shaving go a lot easier and a lot quicker. For guys who like to get out of the house quickly in the morning, this is a huge benefit and it also makes it an ideal choice for travel. Many of the men actually replaced their braun razor with this one and they will never go back. Another guy was questioning about it’s ability to be waterproof so he tried it in the shower and everything worked fine. He said it was actually easier to use it there and keep it clean. Where Can You Get A Good Price on the Panasonic ES8103S? When you compare this very affordable price to what you would pay for even a few months’ worth of blades for a traditional razor, you can see why so many guys are now opting for this kind of advanced technology. You will also see that this model is on the lower price end of shavers that Panasonic makes. Their Arc5 models have more bells and whistles and more technology but this is seriously a great deal to get you going. Is This the Best Shaver for Your Needs? If you have been searching for a high quality and technologically advanced three blade cutting system, then the Panasonic ES8103S is certainly a very affordable choice. This has all the convenience of wet and dry shaving, is 100% waterproof for easy washing, and has an incredibly fast motor drive to help give you the best quality shave every single time and for years to come. The regular price of the Panasonic ES8103S is under $100 dollars, but you can currently purchase it for the best discount here on amazon.